Biochemistry 501: Introduction to Biochemistry is being taught in the summer for the first time, and with the support of a grant to bring active learning and technology into the classroom, the class has all the right elements for success. The introductory class, offered by the Department of Biochemistry in the College of Agricultural and Life Sciences, is an essential course for many students on campus that need credit for their degrees or need to satisfy a pre-requirement for professional school, such as vet or medical school. Being a “flipped” summer class with active learning, it offers students the chance to experience a smaller class size and smaller student-to-instructor ratio. In this flipped class, students watch lectures and complete a quiz, all before coming to class. Classroom time can then be devoted to discussion of problem sets. This the first time the course is being taught in the summer. Biochemistry faculty associate Lisa Lenertz teaches half of the eight-week course, with professors Richard Amasino and Sam Butcher each teaching 25 percent. They also have three student helpers who serve as discussion leaders. Aiding the creation of the flipped summer classroom is a grant from the university’s Educational Innovation Small Grants program. Lenertz applied for the funding to record and edit lecturers for the students to watch before class, freeing up time to work on problems during class time. The recorded lectures are edited to include only essential information, as well as annotated and close captioned for accessibility. Lenertz says she is continuing to work on more lecture videos but also incorporating other technology into supplemental material for students to work through. With the course being so beneficial to students, the demand for it is high. Overall, approximately 1,400 students take the course per year during the spring and fall. Offering the class in the summer reduces some of the bottle neck effect and allows students another option if they learn better in smaller groups. Carly Kibbe, a postdoctoral researcher at UW–Madison, has a background in biochemistry and is serving as one of the three discussion leaders for the course. Having been a discussion leader for two long semesters, she jumped at the chance to help with the summer flipped class. The summer course and educational grant are helping inspire the next generation of innovative educators, as Kibbe will be taking her skills to UW­–Green Bay as a faculty member in January. 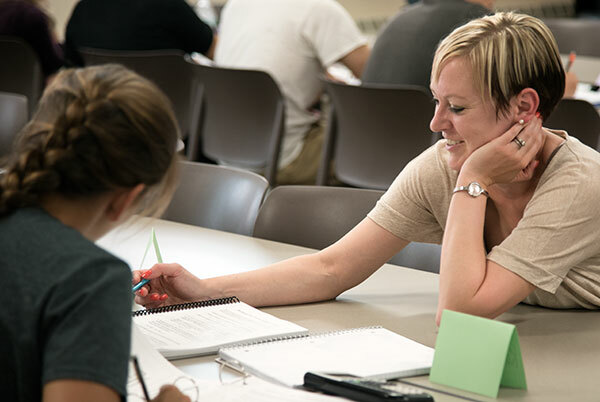 College of Agricultural and Life Sciences associate dean for academic affairs Sarah Pfatteicher echoes how the course provides flexibility to students seeking to concentrate on just one or two courses at a time during the summer.